Bionic arms have often been seen as the stuff of science fiction. But now, a British company is offering fully bionic prosthetics at almost half the price of other competitors -- The Hero Arm. A startup is offering custom-built arm prosthetics that are more affordable, stylish, and can be controlled by a user’s brain. Humans have been using artificial limbs for a long time – with images like pirates’ peg legs and hooked hands being popularized in our imagination. In the 21st century, advances in science and medicine have led to a revolution in prosthetics technology. Bionic prostheses seem to be the culmination of progress in this field, and while they provide new hope for people with disabilities, they are very costly. At tens of thousands of dollars, available bionics have prices that most people find prohibitive, but there’s a British robotics company that’s working to change that. Using 3D printing technology to manufacture prosthetic limbs is shaping up to be a dynamic market in the near future. Several companies and startups have embraced additive manufacturing techniques to make affordable, comfortable, and custom-made prostheses. One of them is Open Bionics, a Bristol-based startup founded in 2014 which designs cheap, custom-built, and stylish mind-controlled assistive devices. The first product to come out of OB’s labs was the Hero Arm, a 3D-printed bionic arm that costs £5000.00 (around $6,700 USD). Maybe that’s still expensive for some, but costing “less than half the price of its nearest competitor” the Hero Arm is a lot more affordable than other available options. 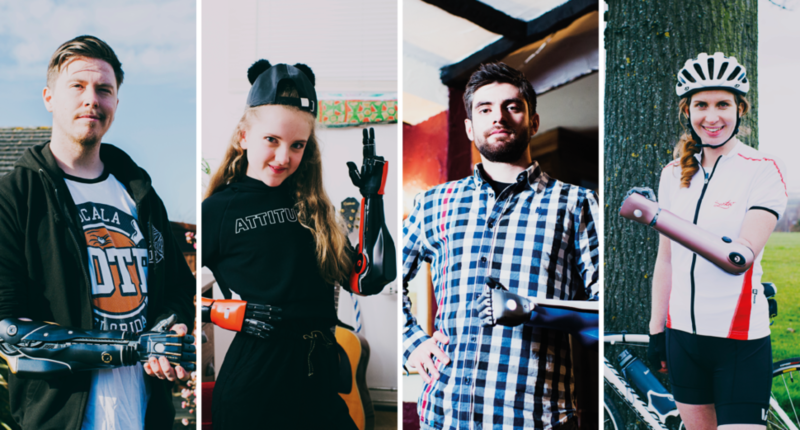 The Hero Arm is a custom-made multi-grip bionic arm designed for below elbow upper-limb amputees aged nine and up. The Hero Arm is also fully customizable in terms of design, dimensions, and comfort. All the components of the arm are custom-designed and 3D printed before they’re assembled. Users can opt for a number of different covers, starting at £199.00 (around $265), or can even design their own cover that suits special styles or seasons. Open Bionics also partnered with Disney so that it can provide arm covers themed after some movie and cartoon characters from Disney’s Star Wars, Frozen, or Marvel universes. Kids can personalize their bionic arm cover with Elsa from Frozen or Marvel superheroes like Iron Man. Open Bionic also collaborated with videogame publisher Eidos (Montreal, Canada) to offer Deus Ex covers (at £399.00). Retrofitted with long life batteries and advanced software, the Hero Arm is also strong and can lift up to 8 kg (17.6 lb). More impressively, unlike other prosthetics, the wearer intuitively activates their Hero Arm through smart sensors that detect muscle tension. “With the Hero Arm, technology is at your fingertips. Literally. Special sensors within the Hero Arm detect muscle movements, meaning you can effortlessly control your bionic hand with intuitive life-like precision,” says Open Bionics. In 2016, Open Bionics collaborated with the UK National Health Service (NHS) on a six-month trial of its Hero Arm model. After the success of the first trials, Open Bionics got the seal of approval to commercialize its product as the world’s first medically-certified bionic prosthesis. The Hero Arm went into sale for UK residents last April, but there’s no information as to if and when the product would be available in other countries. Living up to its name, Open Bionics has made its technology open source and shares its R&D with the world. Researchers at Georgia Institute of Technology (USA) have built on Open Bionics technology to create a bionic hand powered by ultrasonic sensors that allow the user to control fingers individually. Wearing this Star Wars-esque bionic hand, Jason Barnes, a musician who lost parts of his arm, can now play the piano just like before his accident. Bionic arms are quickly becoming an easy and available option for amputees, and it will be interesting to see what direction these companies take in the near future. Would bionic prosthesis benefit from other research in robotics, like sensitive artificial skins?